Right after sorting my admission procedures and Before I arrived at Guildford, I took some time to explore the co-curricular activities that I could be a part of whilst I study here at Surrey Uni. A great way to go about finding more about these activities would be exploring the University website and of-course reading the blogs and talking to the current students at the uni if you know any! What caught my attention was the Surrey Sports Park (SSP – yes I cannot stop talking about it). Before I knew it, I had the whole list of uni sports clubs in my hand and was delighted to see that there was an Archery Club! I had a brief encounter with Archery when I lived in Auroville for a bit and always liked the idea of taking part in target sports! Have a bit of experience with rifle shooting (thanks to NCC), but have never tried Archery as it is not a popular sport back in India. And for some reason I always felt that if I did try it, I would enjoy it and be good at it! 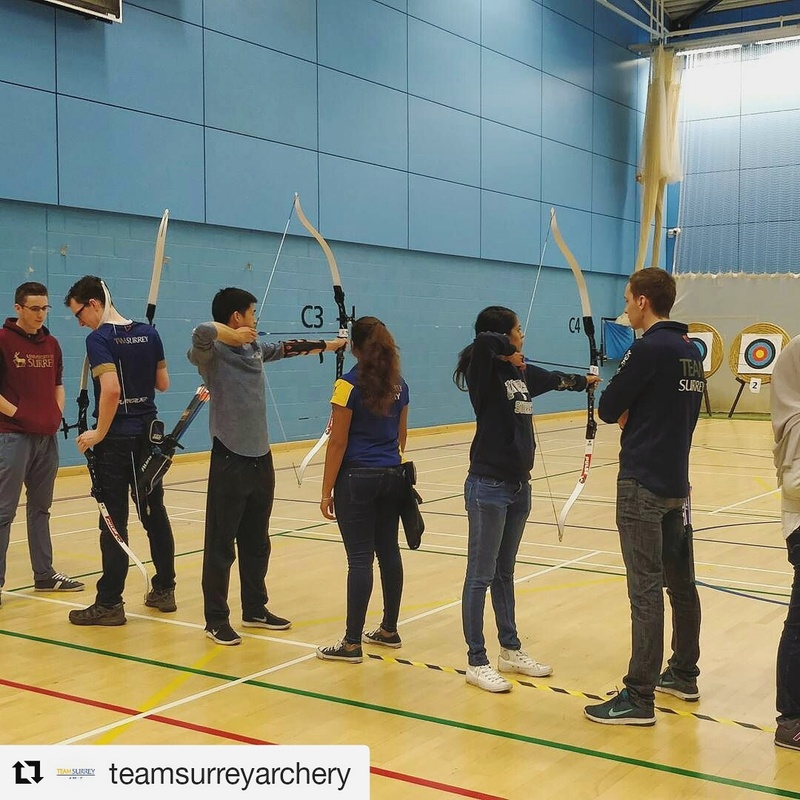 The University of Surrey Archery club welcomes beginners – who’ve never tried archery before (like me) or who have had very little experience! It is also required that if you haven’t done it before, you enroll for the beginner’s course offered after the fresher’s week every year! It’s a basic introduction to everything you need to know about bows, arrows, targets, and how to hold a bow – fix an arrow – aim at the target and Shoot!! The beginner’s course allows you to be a part of the Archery club which trains twice a week! This semester it was on Tuesdays and Sundays where we do indoor shooting in an arena at the SSP, cause you know, it’s cold outside! Outdoor shooting is saved for when the weather is less harsh. If you are a member of the club, it is not required that you buy your own archery kit as you can use the equipment the club already has! But if you enjoy archery, you might consider buying yourself a kit later-on. There are a bunch of experienced archers who will help you and guide you through the whole process of learning how to shoot! You can shoot for leisure, you could do competitive-shooting as well! My scores say I’ve been improving, which is a good sign! We also meet up once in a while for kit-discussions and socials! 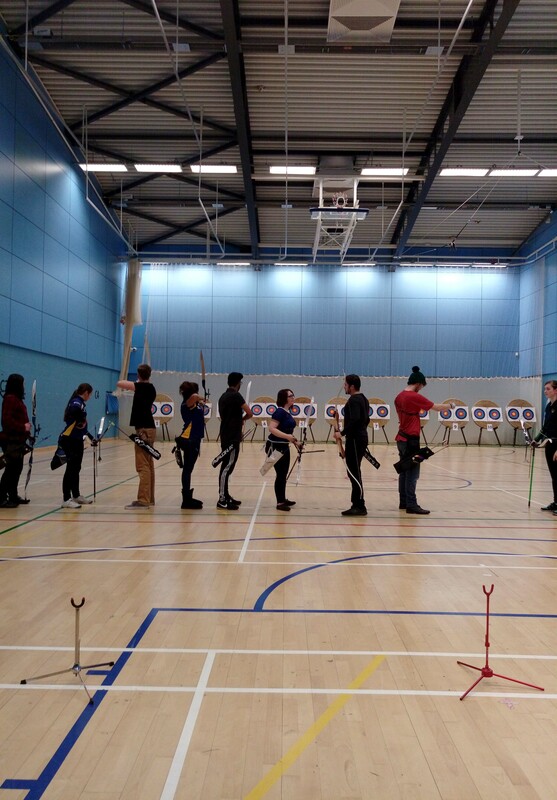 So far, I’ve been selected to take part in SEAL (that’s South East university Archery League) twice – once hosted by Surrey Uni and the other at University of Kent, Canterbury. 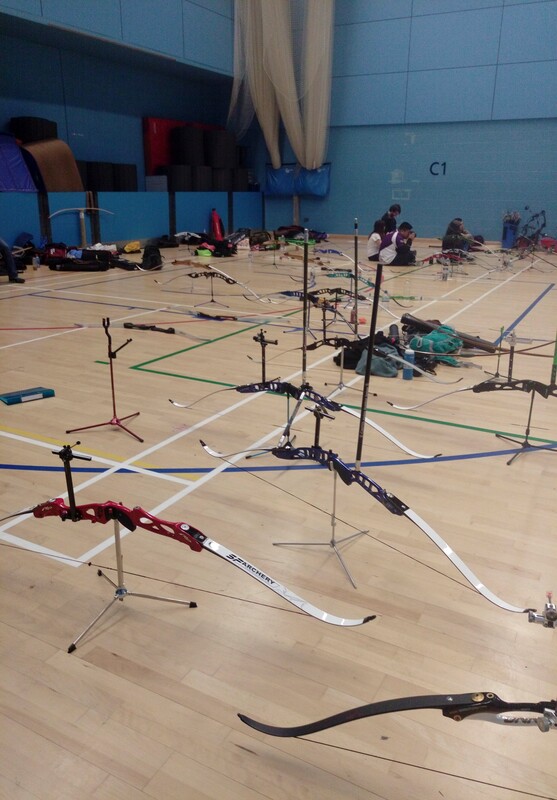 SEAL is a grouping of institutions in the south east of England, a friendly group of archers that compete with each other to be the best team in the south east! Lucky for me we shoot against novices from the two other universities. 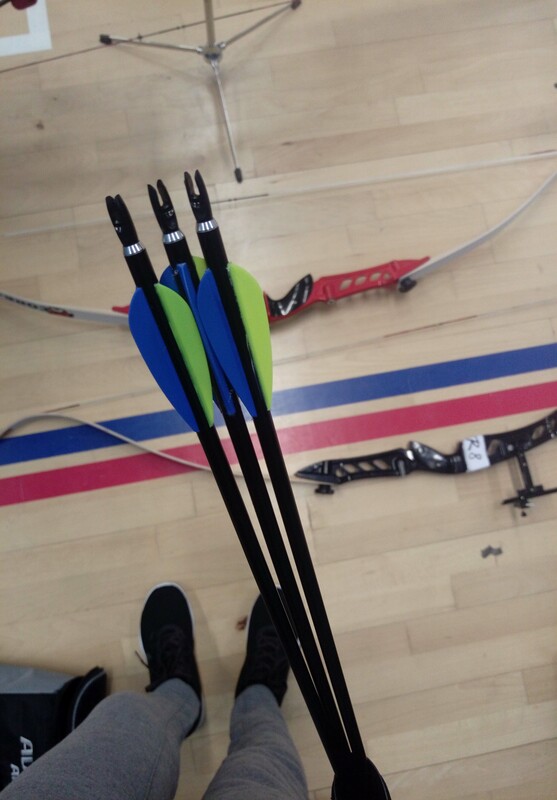 Though my scores weren’t exceptional, I did enjoy both the leagues where I managed to score the highest both the times amongst the novices – Lady Recurve aaand improve my shooting and groupings significantly – pics below! That’s me at the beginner’s course, struggling to hold my bow right! What competitions would look like! Apparently it’s quite important for the archers that their kits follow a good color scheme! This was the league at SSP! 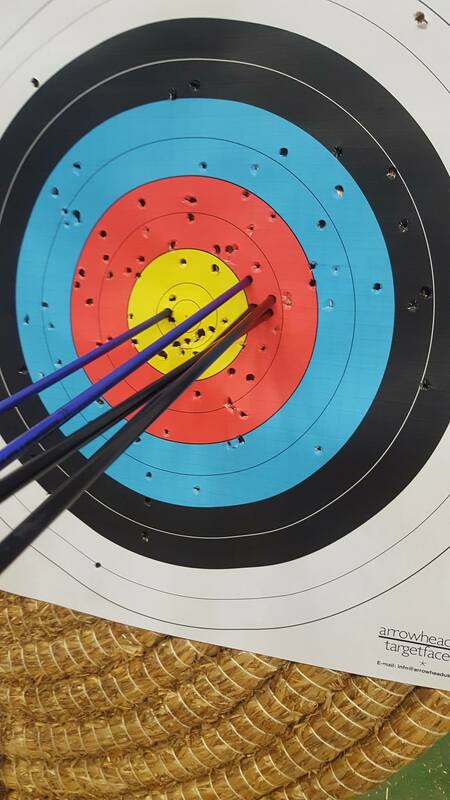 The 3 black arrows in a great grouping would be mine 😛 Working on moving these arrows to the centre now! Hopefully I would get better over time, better enough to reveal my scores to you! Oh, It’s also Winter holidays now! Merry Christmas and Happy Holidays Everyone!